Accidental Heroes is a pulse-racing tale of extraordinary courage, from the world's favourite storyteller, Danielle Steel. Honour. Valour. Fortune.On a beautiful May morning at New York's JFK Airport, a routine plane departs for San Francisco. Security agent Bernice Adams finds a postcard of the Golden Gate Bridge bearing an ambiguous message. Who left the postcard behind, which flight is that person on, and what exactly does the message mean? Her supervisor dismisses her concerns but she is compelled to contact Homeland Security.As the flight takes off each of the passengers is looking forward to reaching San Francisco, whether it's for a family reunion, a wedding, or a new way of life. 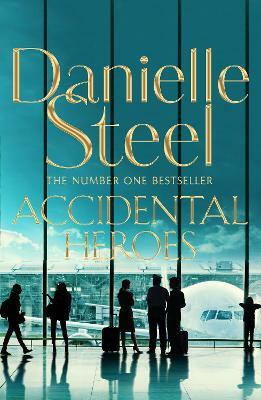 But as it emerges, there's someone on the flight planning something terrible and these strangers' lives entwine as they come together to help to avert a tragedy at the eleventh hour.Danielle Steel combines intense action with stories of emotionally rich, intertwined lives. As the plane bears down on its destination of San Francisco, the futures of these strangers will be changed forever by a handful of accidental heroes.Accidental Heroes is a heart-stopping thriller about ordinary men and women who embark on a journey they will never forget. Danielle Steel has been hailed as one of the world's most popular authors, with nearly a billion copies of her novels sold. Her recent many international bestsellers include The Duchess, The Right Time and Fairytale. She is also the author of His Bright Light, the story of her son Nick Traina's life and death; A Gift of Hope, a memoir of her work with the homeless; and the children's books Pretty Minnie in Paris and Pretty Minnie in Hollywood. Danielle divides her time between Paris and her home in northern California.